- Publisher Martyn Lloyd-Jones' hard work in the difficult War and post-War years became the preparation for his great influence in London in the fifties and sixties. But these pages trace his ministry into wider circles - to the Universities, to Europe, the United States, South Africa and ultimately, in his books, to the whole world. 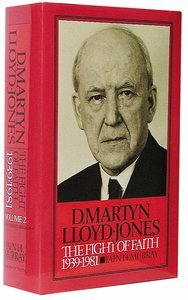 About "Life of D Martyn Lloyd-Jones (Vol 2)"
Martyn Lloyd-Jones' hard work in the difficult War and post-War years became the preparation for his great influence in London in the fifties and sixties. But these pages trace his ministry into wider circles - to the Universities, to Europe, the United States, South Africa and ultimately, in his books, to the whole world. Murray, born in Lancashire, England, was educated in the Isle of Man and at the University of Durham and entered the Christian ministry in 1955. He served as assistant to Dr. Martyn Lloyd-Jones at Westminister Chapel (1956-59) and subsequently at Grove Chapel, London (1961-69) and St. Giles Presbyterian Church, Sydney (1984-84), Although remaining a minister of the Presbyterian Church of Australia, he is founding trustee for Banner of Truth Trust.